This April we commemorate the entrance of the United States into WWI. Almost all countries were impacted by WWI but one that I recently visited played a unique part in the war. We often feel that one person who is neither a king or ruler or even a high-ranking official can't have much impact on history or world events. But one "little" person did have a tremendous effect on the events that transpired in that war and perhaps still influence world conditions today. T.E. Lawrence was a young British army sent to the Middle East before American became involved in the war. He was a slim wiry young man that stood about 5'5" but he cast a tall shadow over future world events. The world remembers him today as Lawrence of Arabia. 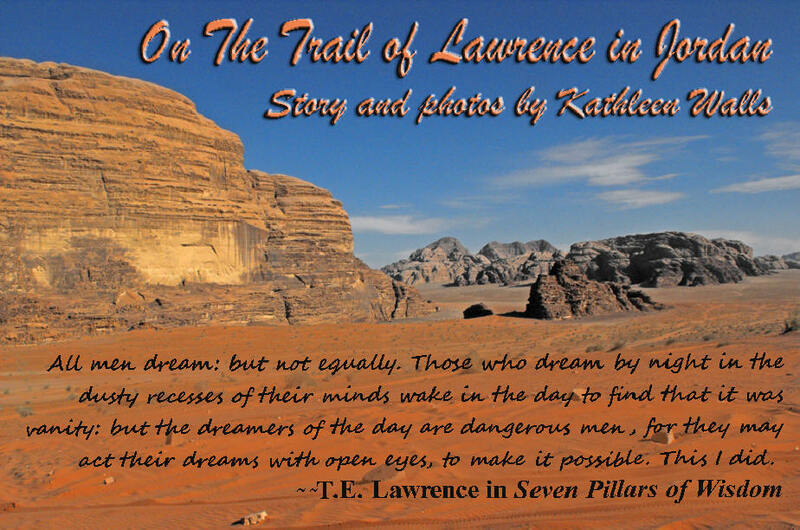 You can visit many of the sites involved in Lawrence's time in Jordan. It's a trip that made a lasting impression on me. The great-uncle of the Hashemite Kingdom of Jordan's present king, Abdullah II, was Faisal, the Arab leader that Lawrence advised and fought besides. Jordan is safe and very welcoming to foreign tourists. Unfortunately, Turkish sites are less safe to visit. One of the most important objectives related to Amman, then just a sleepy village, was the Hejaz Railway. It was the lifeline of the Ottoman Empire. Lawrence personally blew up 79 railway bridges. He strove to leave a bridge "scientifically shattered" useless and barely standing. The Turks then had to take down the rubble before repairs could begin. Today, the only portion of the railway remaining is from Amman to Damascus but due to the war, you cannot ride that far. The Jordan Hejaz Railway Corporation still does some trips to Al-Jeezah station near Queen Alia International Airport, and to Al Qaser station- Umm Al Hiran near the Radio and Television Corporation, and to Al-Zarqa and Al-Mafraq. There is a small museum near the Amman station. The "ruined Roman village" Lawrence referred to is well worth a visit. 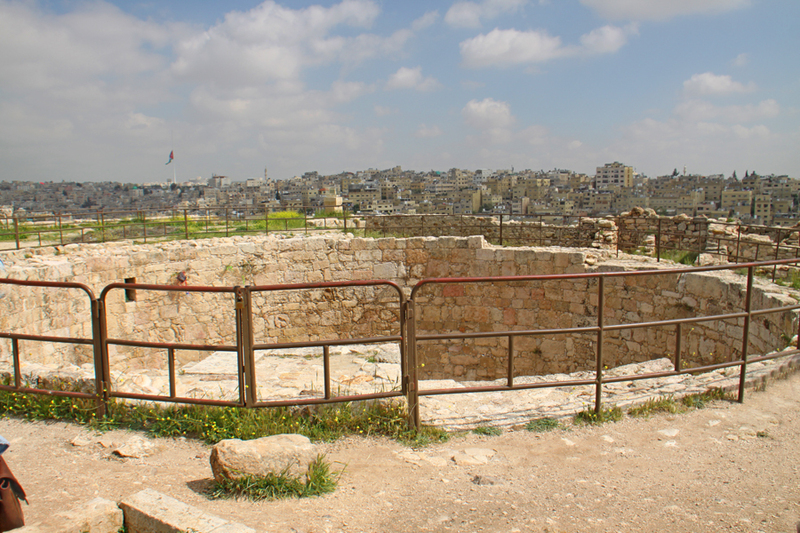 It is The Citadel, site of the ancient city of Rabbath-Ammon. 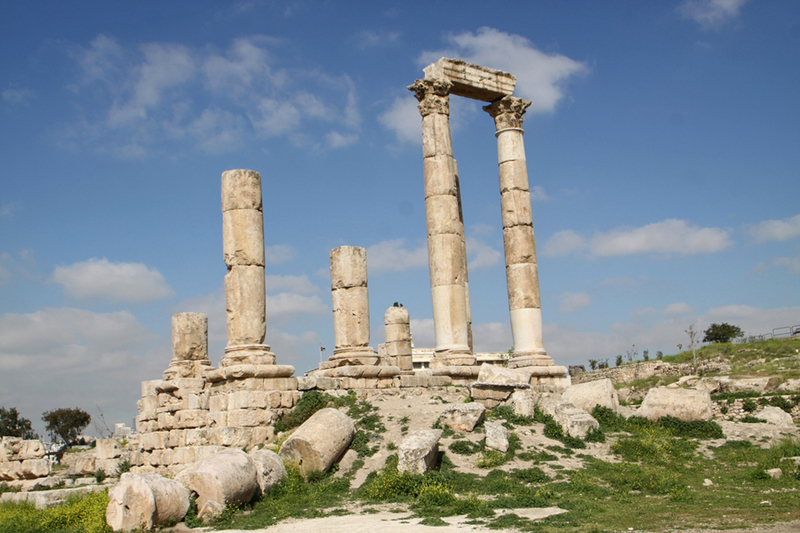 It towers on the highest hill over modern Amman and was occupied since the Bronze Age, around 720 AD. The cistern he spoke of is the Umayyad Cistern. A marvelous bit of ancient architecture; it shows the knowledge these people had of construction. It is an enormous circular holding pit built of stone with steps leading down to the bottom. It supplied water to the palace and the adjourning homes. Lawrence's men and camels must have been thrilled to see it. Other things you want to be sure and see there include the Temple of Hercules, a Byzantine church, and the Umayyad Palace. The fingers on display as "Hercules' Fingers" have created debate. Many people feel the fingers look feminine and not meant to represent Hercules. When the temple was originally unearthed there was no indication to which god it was dedicated. Archeologists chose Hercules arbitrarily. The fingers were unearthed later. The Jordan Archaeological Museum there gives a good overlook of Jordan's archeology dating from prehistoric times to the 15th century. The Citadel is considered one of the oldest continually occupied places on earth. 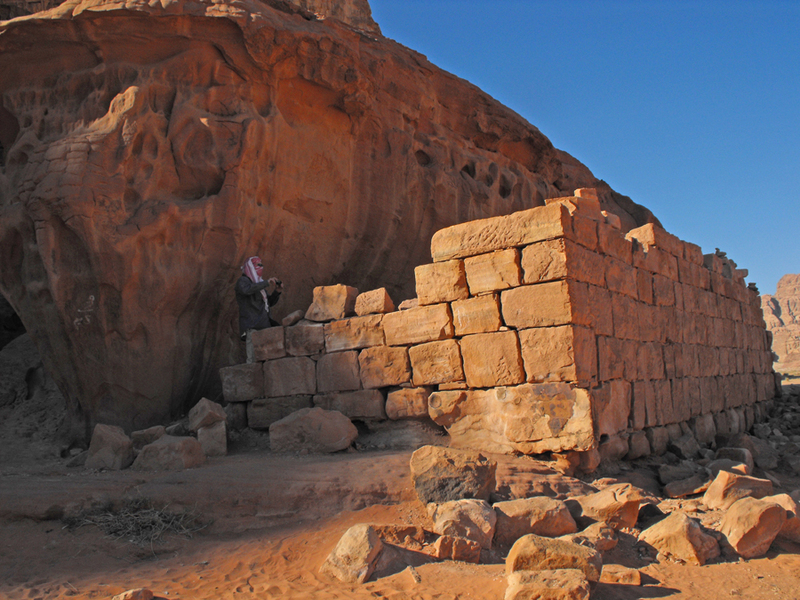 About 62 miles east of Amman, on the highway to Iraq, you can visit one of the desert castles, Qasr al-Azraq built of local black basalt rocks that gives it its name, the Black Fortress. 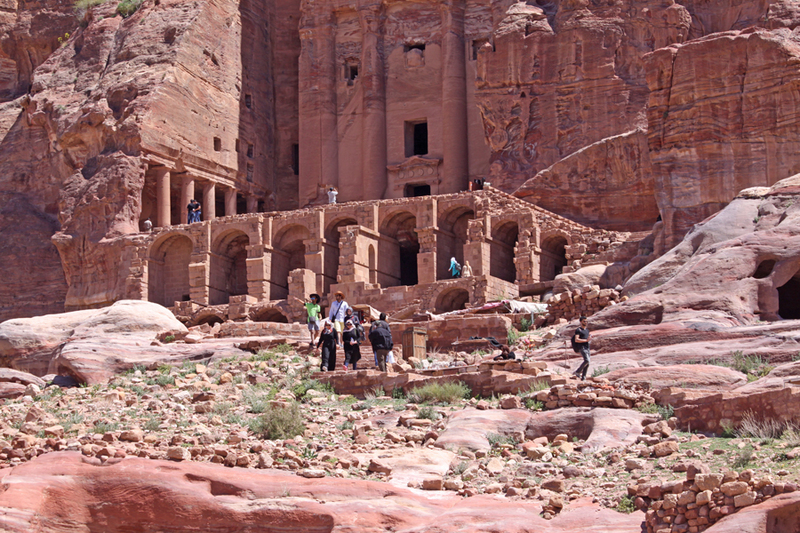 This structure dates to the early 13th century A.D., but there were earlier structures there. It served as Lawrence's headquarters during the winter of 1917. I have read hosts of the most beautifully written accounts of it, and they give one no idea of it at all…so you will never know what Petra is like, unless you come out here… Only be assured that till you have seen it you have not had the glimmering of an idea how beautiful a place can be. - T.E. Lawrence February 1914. Just the vastness of Wadi Rum will humble you. 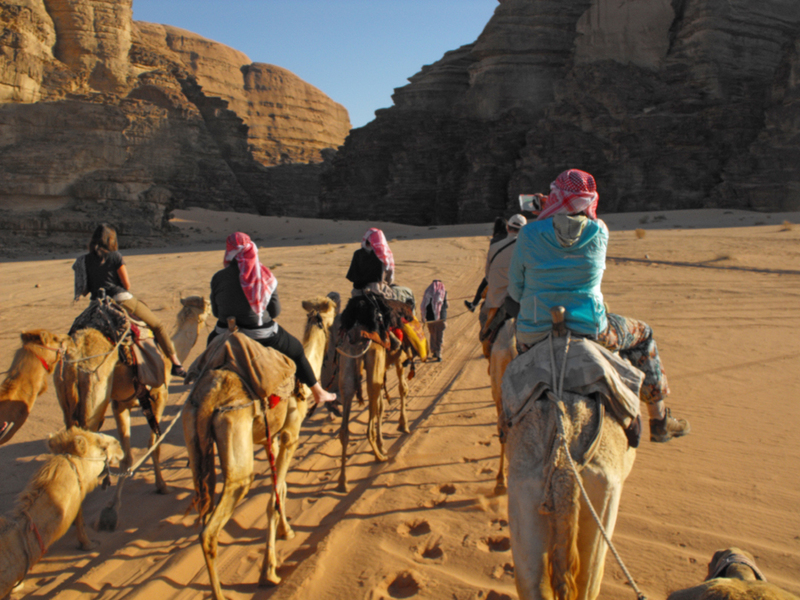 The best way to experience it as Lawrence did is by booking either a four-wheel drive tour or a camel trek into the desert. The camel ride is a bit rough on your hindquarters. One thing I learned was when your camel begins to rise hold tight to both the front and back horn to keep from being tossed off. 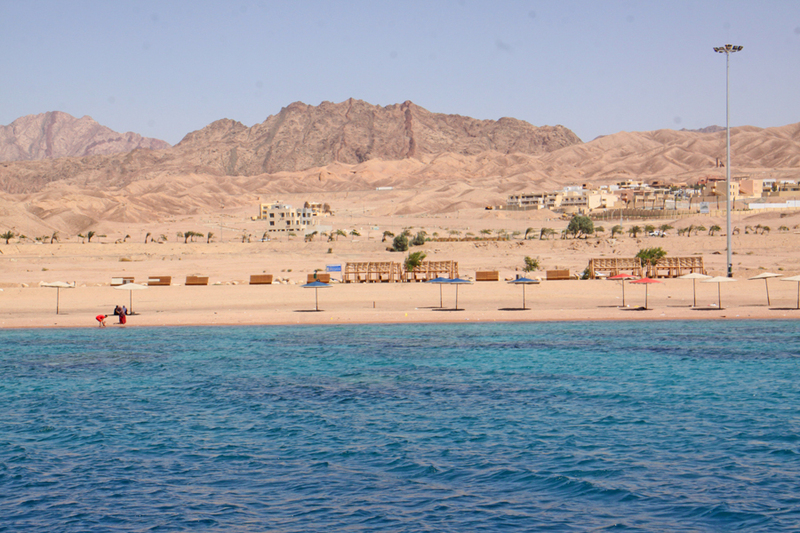 Aqaba is Jordan's only seaport and exit to the Red Sea; vital to both armies during WWI. Today it's a big tourist destination with lots of things to do. The beach is refreshing after all the desert. There is a small museum and some ruins. 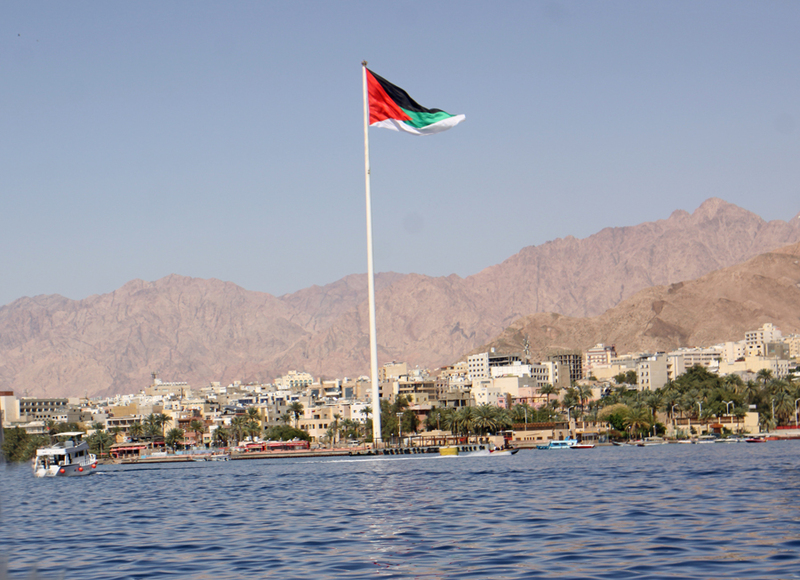 Flying above the seaport on the world's highest flagpole waves the proud Jordan Revolt Flag. Beach at Aquaba much as Lawrence and Arab raiders would have seen it minus the tourist touchs. Snorkeling and scuba are big here so a yacht cruise is a great way to relax after the desert experience. I was on Sea Guard's Barakah but Sea Guard has other boats and there are other companies, as well as glass-bottomed boats, and other individual excursion. Make your reservations ahead of time. From the water looking at the beaches and recalling the terrain of Wadi Rum behind Aqaba, you have a better understand of what a feat it was when Lawrence and his Bedouin army swooped down on the undefended rear of the city. The Souk here is filled with real Jordanian items. Visit a spice merchant, Al-Baba Spice and Coffee. He will offer you a cup of tea and samples of his spices. You'll find scarves and head gear, silver jewelry, clothing and just about any other item you want. Would Lawrence be surprised at the state of affairs in the Middle East today? Probably not. When the Arabs revolted against the Turkish Ottoman Empire, Great Britain promiused them an independent Arab state. At the time they made the promise they were aware it was a lie. Great Britain and France had already signed a prior agreement dividing the Arab states among themselves. At the Paris Pease Convention, our own President Wilson stood with France and Great Britain and allowed this lie to Prince Faisal and the Arab people to prevail. Lawrence knew something of the Sykes-Picot Treaty when he rode with Faisal but eased his coconscious by believing that if only the Arabs could prove their worth as allies the treaty would be disregarded. To this day, the movie Lawrence of Arabia is banned in Jordan.Thje peole ther have very mixed feelings about him. When ISIS proclaims their jihadist propaganda, they do so often using a video entitled The End of Sykes-Picot. 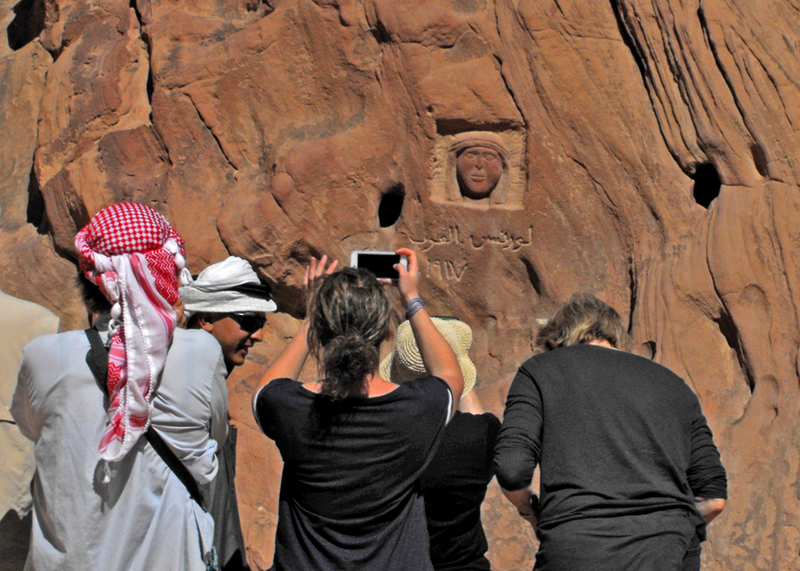 Carving of Lawrence of Arabia's face in Wadi Rum is a popular photo op. Yet today, he is remembered when many other "bigger names" are forgotten. 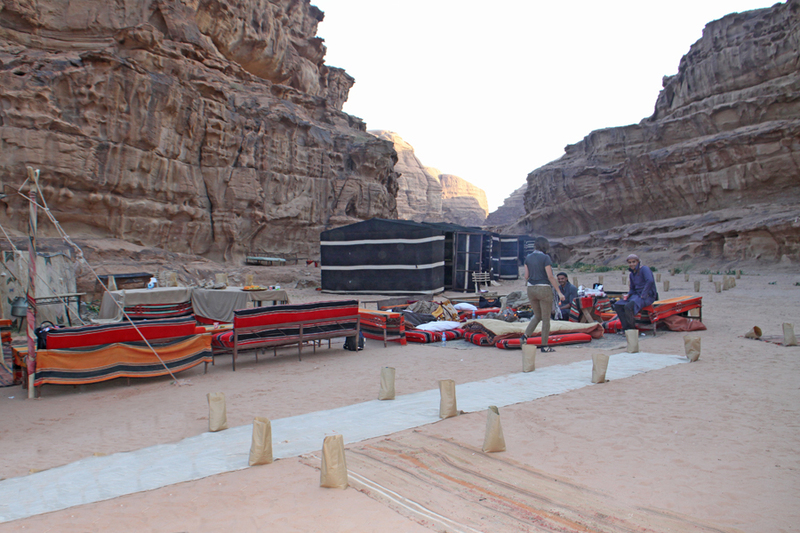 People today visit Jordan to see the things Lawrence described in his book. To stand where he stood. To visualize the events he lived. If you visit Jordan, beware, having once visited this enchanted land you too will "yearn to return." The Lusitania, torpeodoied in British waters. Loss of lives, 1,198 drown, including many women and children and 124 U.S. citizens. President Woodrow Wilson threatened ending relations with Germany. Tthe Germans agree to cease unrestricted submarine warfare. The Sykes-Picot Agreement signed giving Syria and Lebanon to France, while Britain claims Jordan, Iraq, the Gulf states and the Palestinian Mandate. Arabs have been under Ottoman rule for centuries. He ran on the slogan, "He kept us out of war." Considered "The War to End All Wars"
Arab countries are divided pretty much as the Sykes-Picot Treaty agreed. Faisal was made king of Iraq. In 1946, Jordan became an independent state officially known as The Hashemite Kingdom of Transjordan. Abdullah I bin al-Hussein, Faisal's brother, was named King of Jordan.